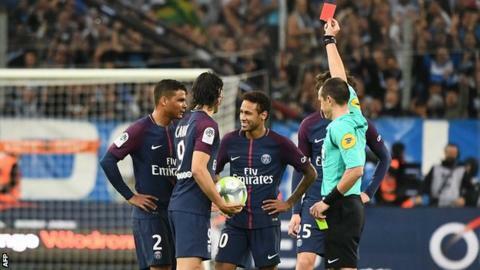 Edinson Cavani scored a stunning 93rd-minute free-kick to salvage a draw for Paris St-Germain against Marseille after Neymar had been sent off. Luiz Gustavo got the opener for Marseille with a 30-yard strike before Neymar equalised after the half-hour mark for his 10th goal for PSG. Florian Thauvin put Marseille ahead with 10 minutes remaining before Neymar was booked twice in two minutes. Cavani then equalised with a 25-yard effort that went in off the crossbar. PSG fans are banned from attending the game known as Le Classique and Marseille fans clashed with police prior to kick-off at the Stade Velodrome. Neymar was pelted with objects from the crowd as he took corners in the second half and on one occasion had to be shielded by police as he took a set piece. The Brazil forward, who joined from Barcelona for a world record £200m, received his second booking on 87 minutes after an altercation with Lucas Ocampos, who went down dramatically in front of the referee. Unbeaten PSG are four points clear of Monaco at the top of Ligue 1, while Marseille stay fifth. Elsewhere, former Manchester United winger Memphis Depay scored the first hat-trick of his career as Lyon beat Troyes 5-0 to climb to fourth. Match ends, Marseille 2, Paris Saint Germain 2. Second Half ends, Marseille 2, Paris Saint Germain 2. Thomas Meunier (Paris Saint Germain) wins a free kick in the defensive half. Goal! Marseille 2, Paris Saint Germain 2. Edinson Cavani (Paris Saint Germain) from a free kick with a right footed shot to the top left corner. Morgan Sanson (Marseille) is shown the yellow card. Attempt missed. Morgan Sanson (Marseille) right footed shot from the centre of the box misses to the left following a fast break. Attempt saved. Bouna Sarr (Marseille) right footed shot from the right side of the box is saved in the centre of the goal. Second yellow card to Neymar (Paris Saint Germain). Lucas Ocampos (Marseille) is shown the yellow card for a bad foul. Substitution, Paris Saint Germain. Ángel Di María replaces Kylian Mbappe. Goal! Marseille 2, Paris Saint Germain 1. Florian Thauvin (Marseille) right footed shot from very close range to the bottom right corner. Assisted by Clinton N'Jie with a cross following a corner. Corner, Marseille. Conceded by Adrien Rabiot. Attempt blocked. Clinton N'Jie (Marseille) right footed shot from the left side of the box is blocked. Assisted by Andre Zambo Anguissa. Attempt missed. Thiago Silva (Paris Saint Germain) header from the centre of the box is close, but misses to the left. Assisted by Neymar with a cross following a corner. Corner, Paris Saint Germain. Conceded by Lucas Ocampos. Edinson Cavani (Paris Saint Germain) wins a free kick on the right wing. Offside, Marseille. Steve Mandanda tries a through ball, but Clinton N'Jie is caught offside.